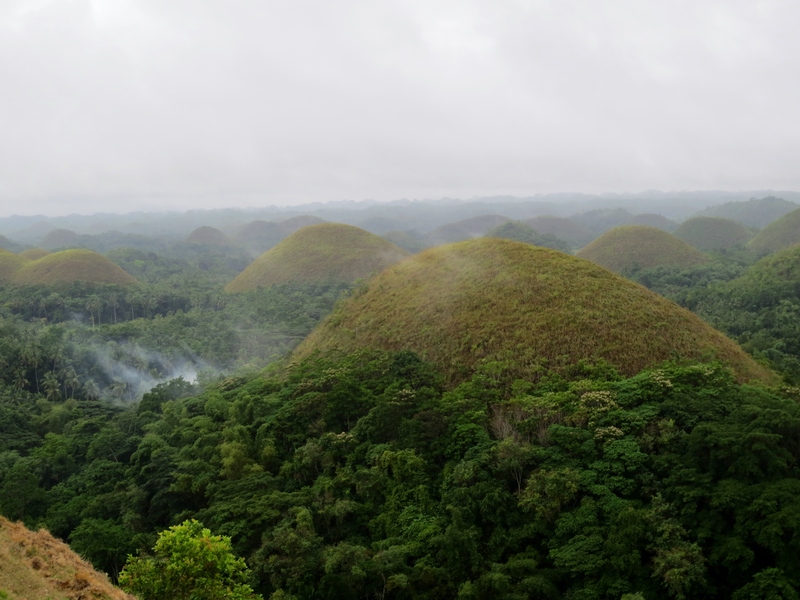 Chocolate hills has been the most famous tourist attraction in Bohol province, Philippines. 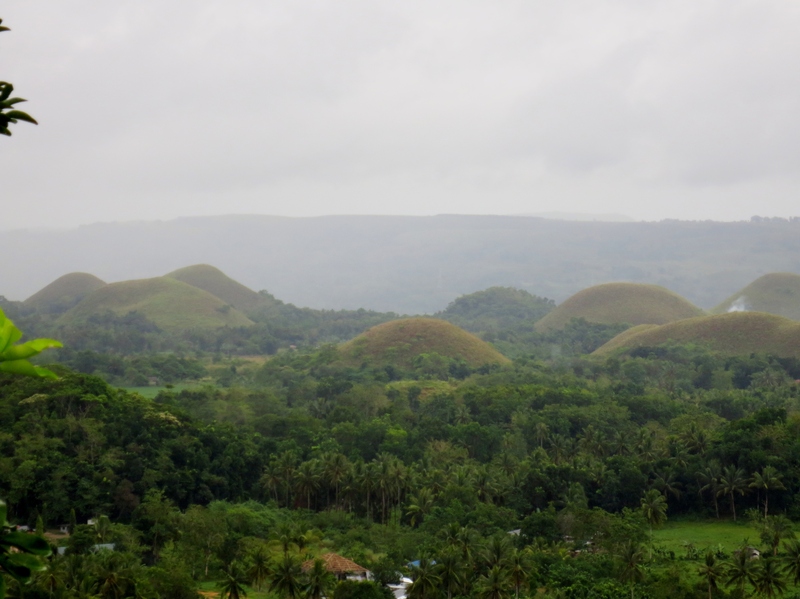 There are over a thousand not-so-high conical hills of almost perfectly symmetrical shape covered by grass thus become green during rainy seasons and turn to chocolaty brown during summer (hence, the name). Folklore legend says the hills were feces of a giant carabao that dried up. haha! Interesting. This prime attraction is located in the town of Carmen. you can actually see more hills from afar during dry season around March to May. Or if you can avoid cloudy days during the rainy season. when we went there, the sky was heavily covered by clouds and it was a little rainy, so it’s sad that we didn’t see a lot of hills. 2. 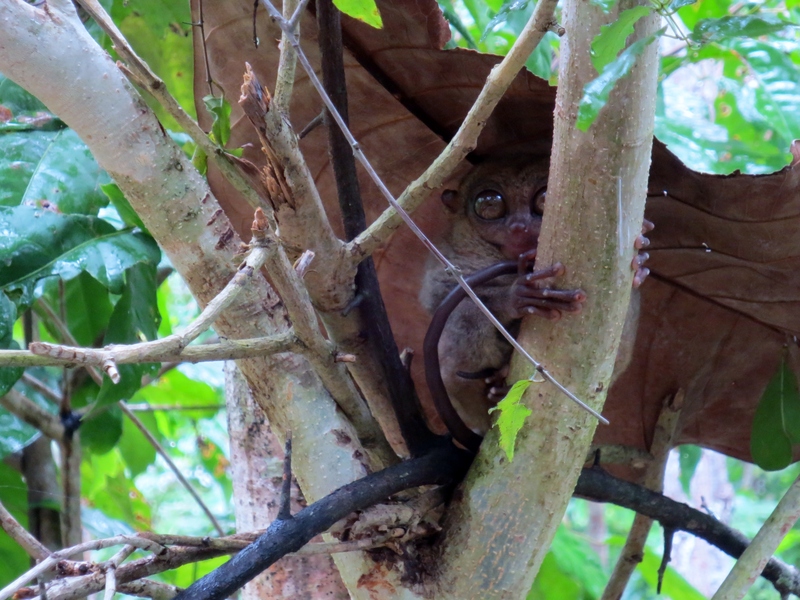 The thin line between “scary” and “adorable” when describing the Tarsiers. 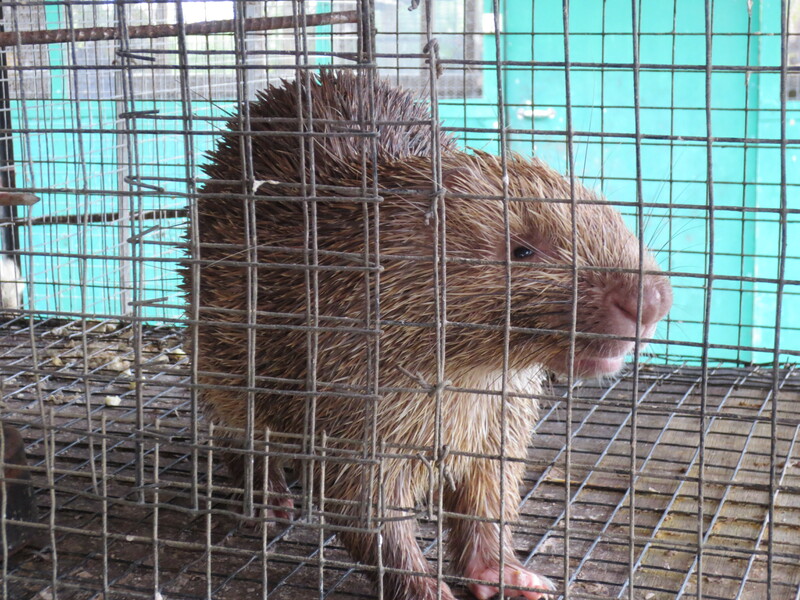 Bohol province has been popular as the home for the tiniest primate with big bulgy eyes known to have suicidal tendencies when gets stressed – the Tarsier. They are very cute and scary at the same time, I don’t know why. . Hehe. . They hide under big leaves when it rains so you may not be able to see a lot of them when it rains but surely the park guides will tell you when they spotted one. 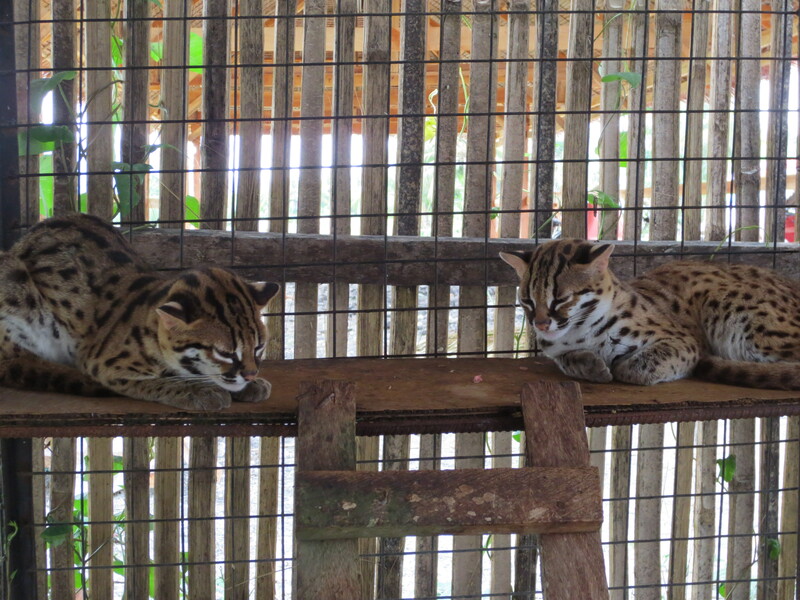 It is also advised not to be loud when checking out these little ones. And turn off your camera flash. 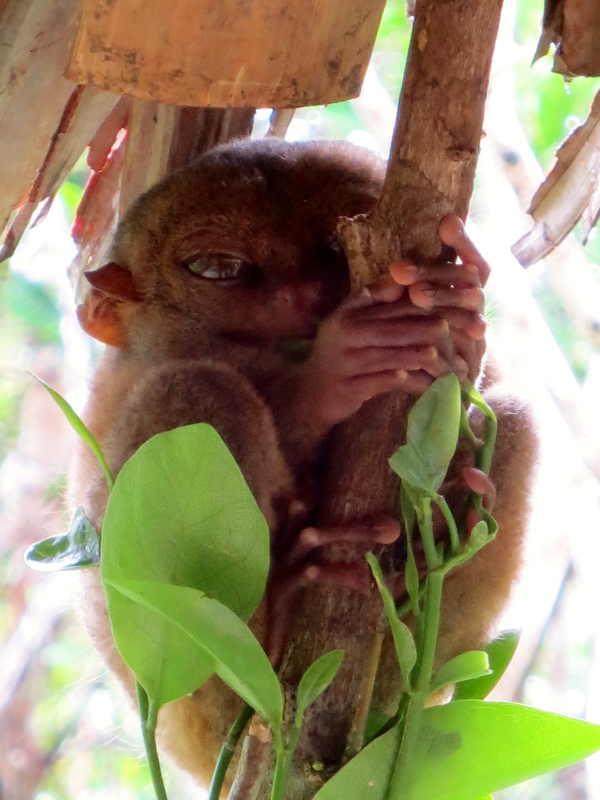 We’ve heard stories that one can never have a Tarsier as a pet and its will not last until the day you take it home. Tarsiers get stressed when they are moved away from its natural habitat and when they somehow endlessly knock their heads until they die. Suicidal, indeed. . It’s interesting to see one going crazy hitting its head on a cage (Jesus, am i sick?) but I would’t dare of course. People must really do their part to preserve these endangered species. soooo cute, right? and scary? hehe. . i think it’s more on the cute side. 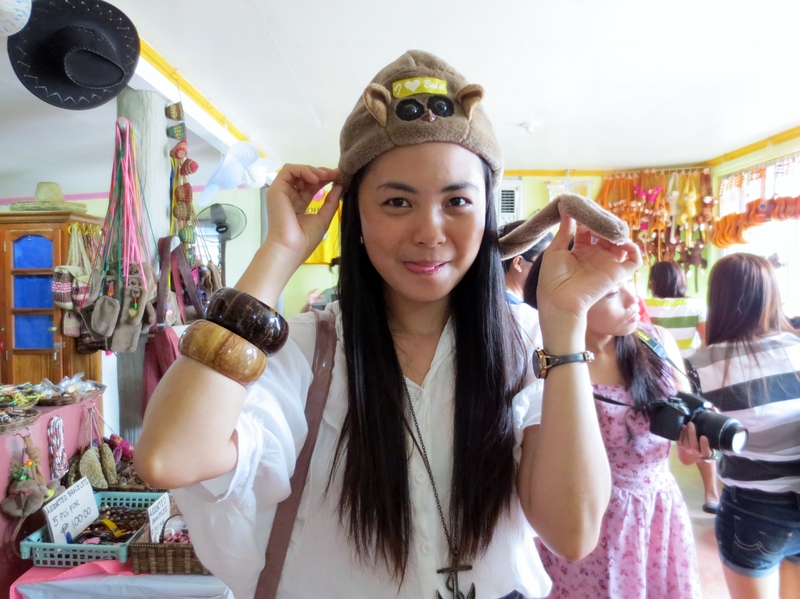 hehe. .
don’t take tarsiers home. . take a tarsier hat instead. . hehe. . 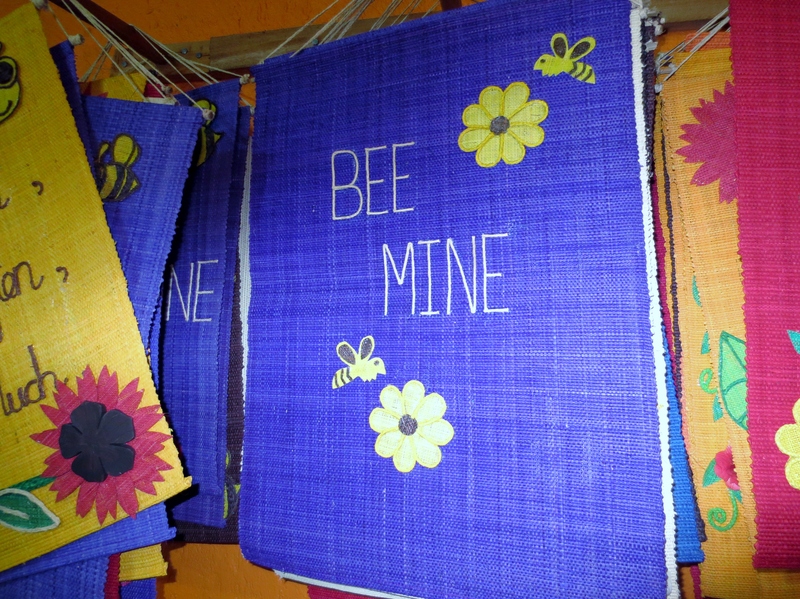 This is at the souvenir shop near the Chocolate hills. 3. 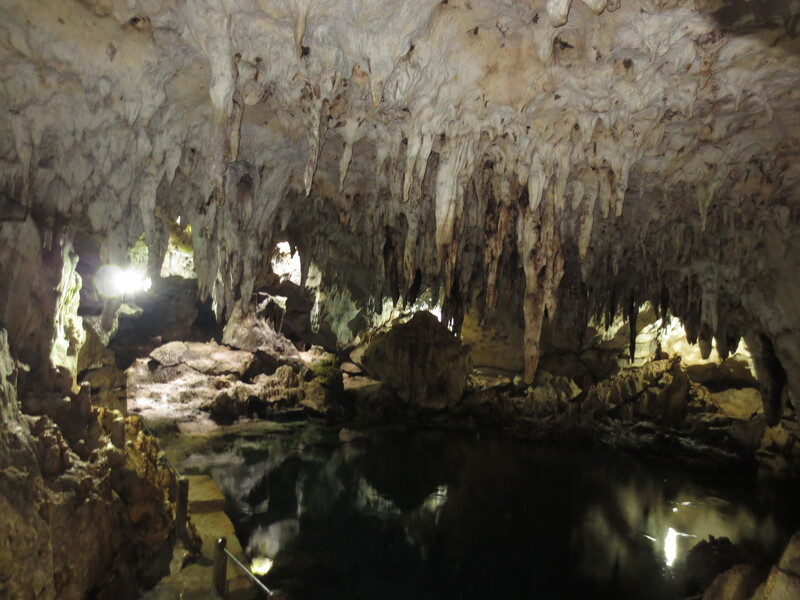 The Hinagdanan Cave and the cold water in it. 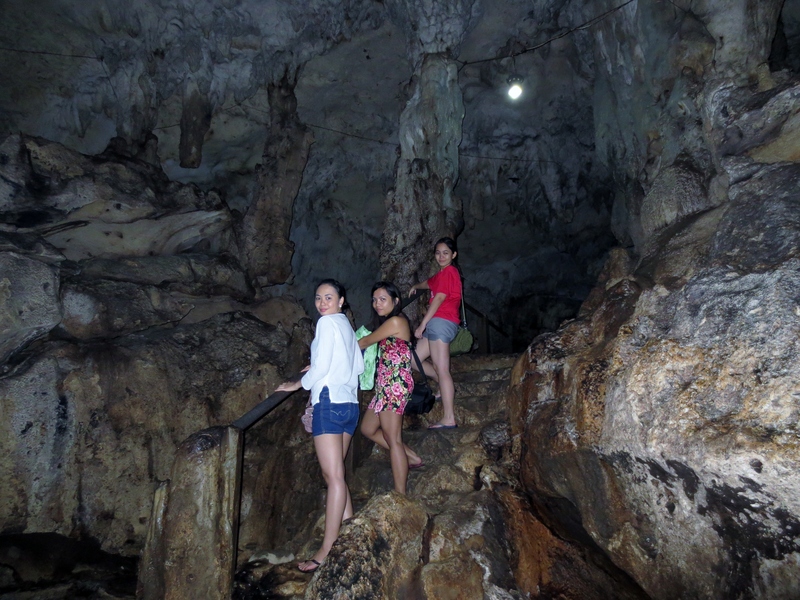 This cave is located in Panglao Island where most beach resorts are located. We were amazed by the rock formations inside the cave, the cold spring water, and the vandalism of the very first inhabitants of the cave. the townsmen have created stairs made of rocks which appear to be similar to cave walls so tourists can go to the underground cave with no sweat. important: the flooring is slippery. be extra careful when walking around the cave. they said that the man who first discovered the cave actually fell from this hole, accidentally. .
On our way to Carmen from Panglao island, our tour guide has given us a quick stop to the man-made forest. 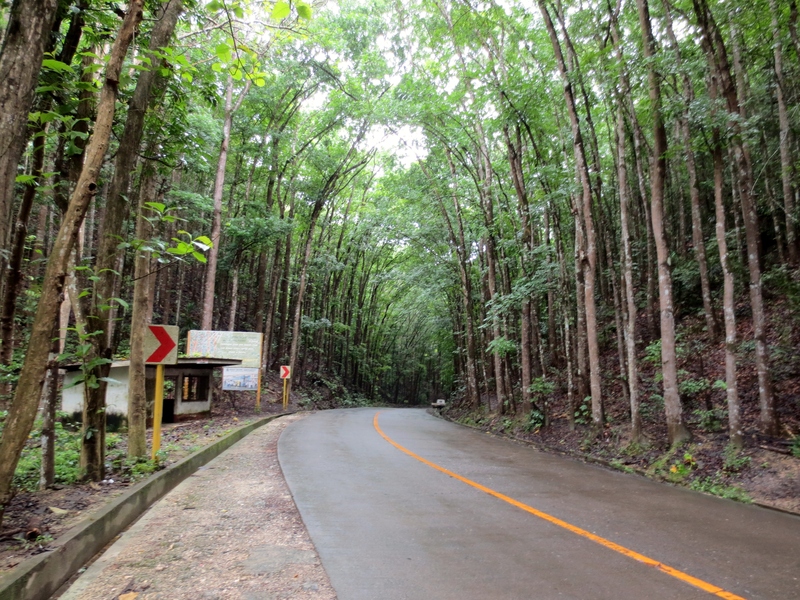 You’ll know when you already are in the middle of this forest as the road will be surrounded by these tall mahogany trees which will make your world suddenly darker and cooler. This was a successful project of the Boholanos and the government after WWII. 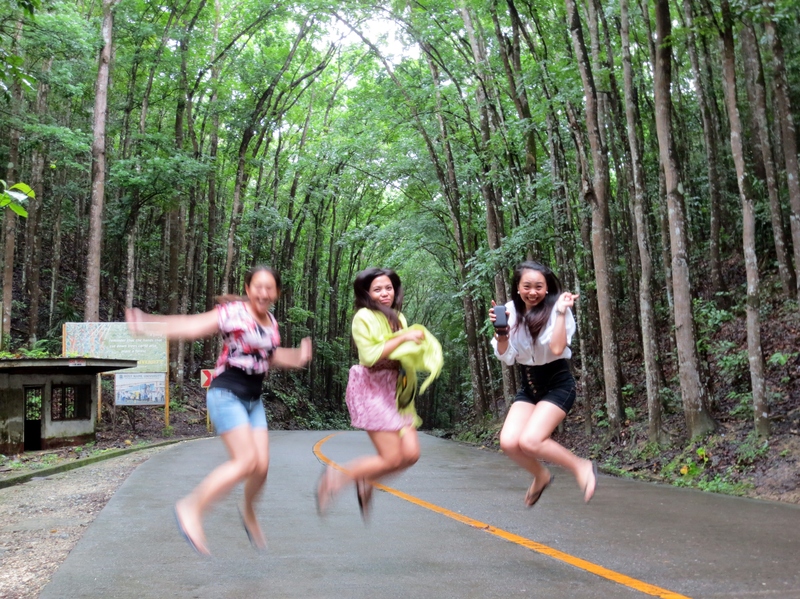 yes, we do love jump shots. and we’re sorry for the low tech camera. . haha. .
5. Butterfly farm! And the caterpillars that scared the sh*t out of me! 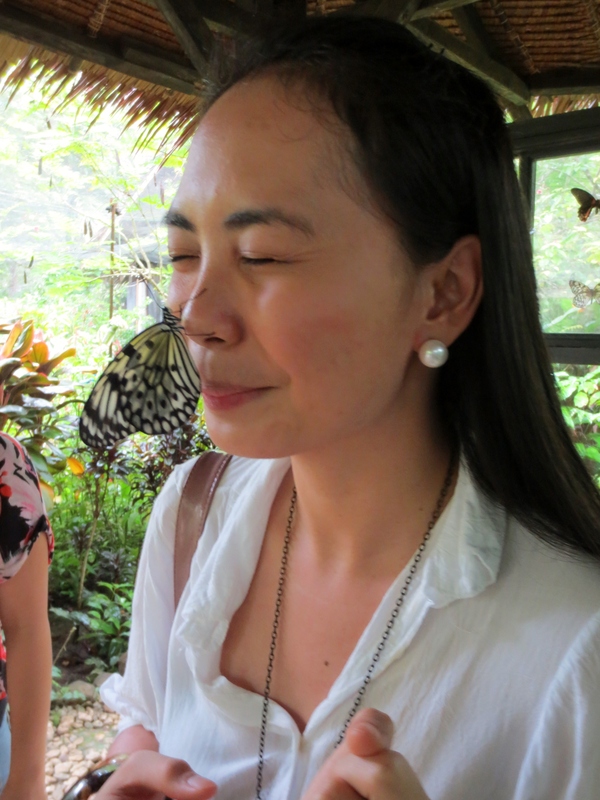 hehe. .
Oh butterflies are always adorable, so we really really have to see this butterfly farm in Bohol. I hated the caterpillars though. The thought that they have lots of feet is enough to give me goosebumps. . brrrr. . big, small, blue, yellow, brown, flying, playing dead, lazy – we’ve seen butterflies of different kinds. haha. .
this is a friendly one. its feet kinda tickle my nose. . hehe. .
6. mini-zoo and those crazy close encounters. 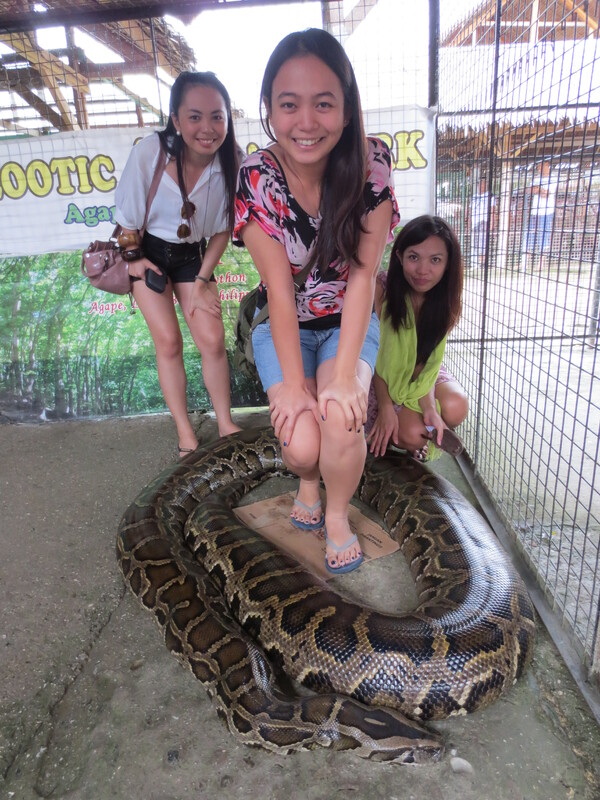 all smiles before the screaming incident. . haha. .
the awwww section! sooo cute! 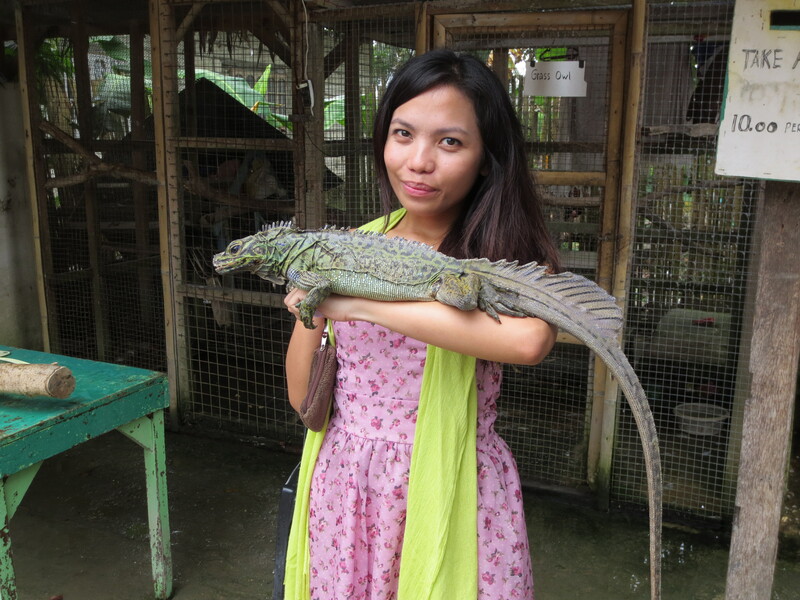 Hi aubrey. . Hi reptile. . please don’t eat my friend. haha. .
7. 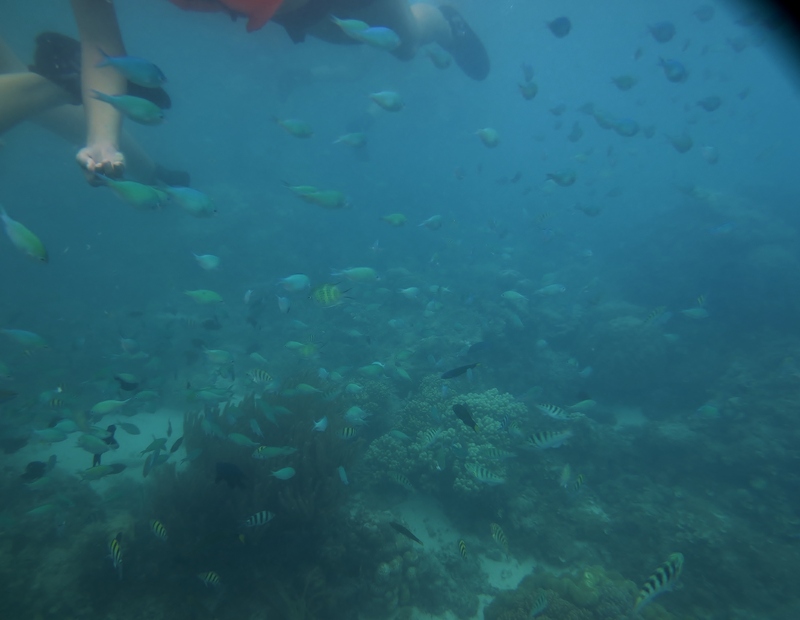 Snorkeling and feeding the fishes! Yey! 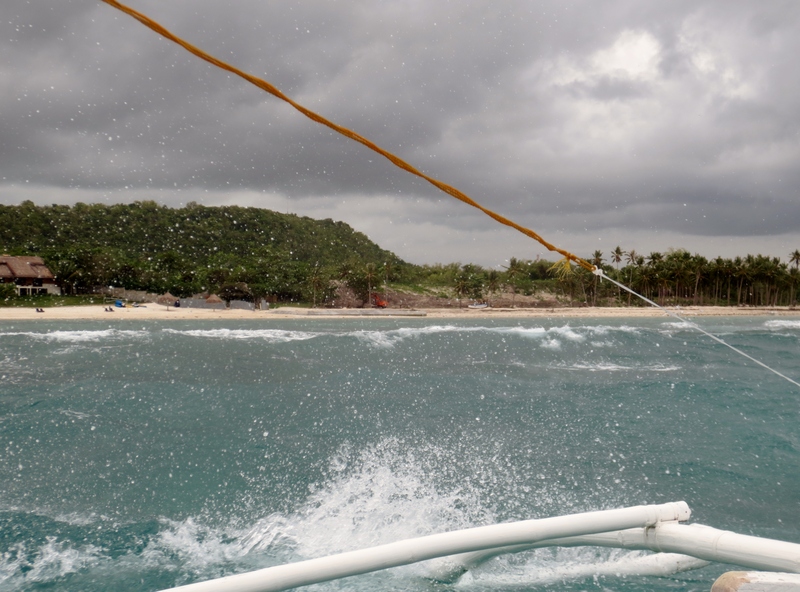 And the treacherous waves during our island hopping. Sigaw! 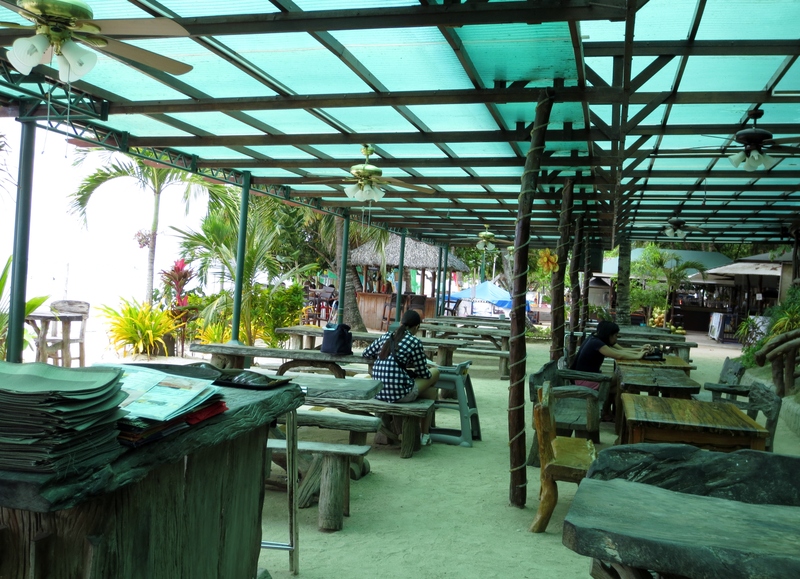 We have island hopped from Panglao and went to a popular snorkeling area. 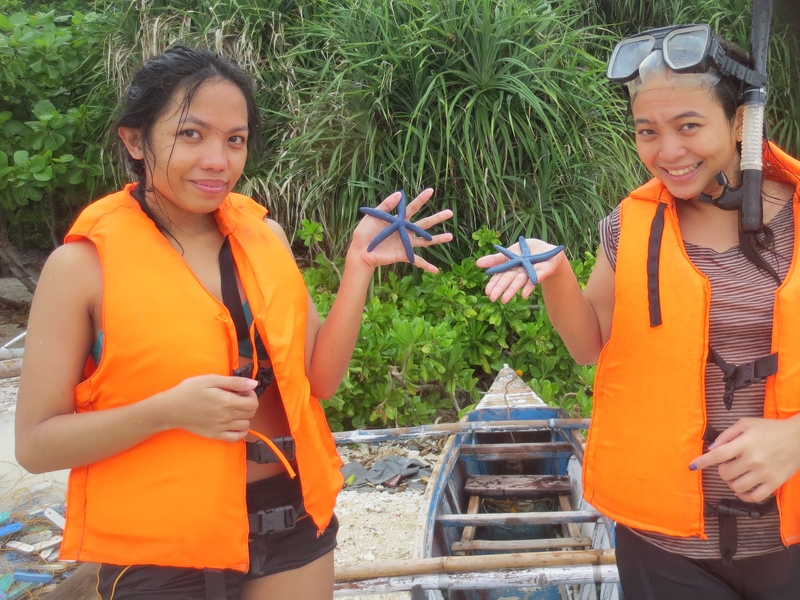 From a small island away from Panglao, we then rode a very small rowing boat as fishemen’s boat are not allowed at the snorkeling area coz the water is too shallow, the propellers might destroy the corals. 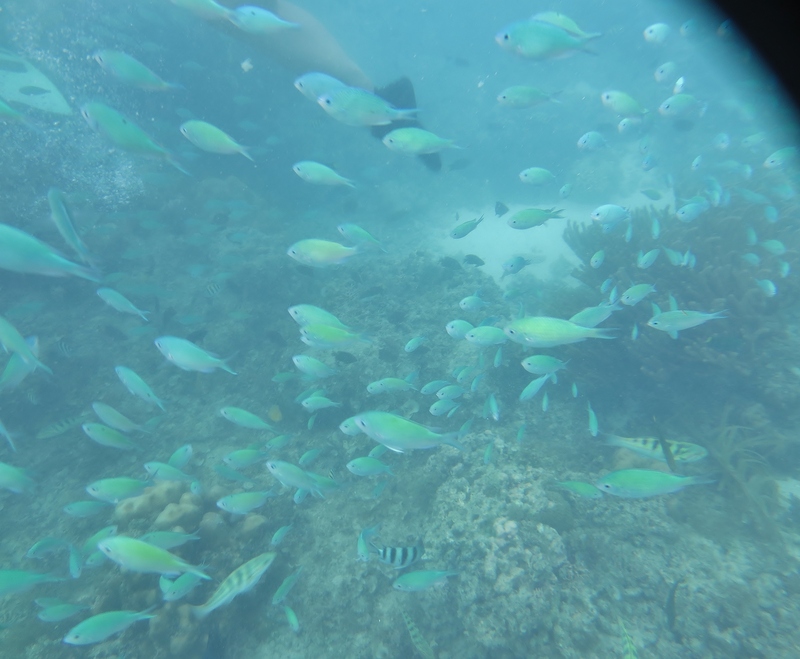 I really loved seeing lots of fishes! I felt a subtle pleasure while feeding them with bread. 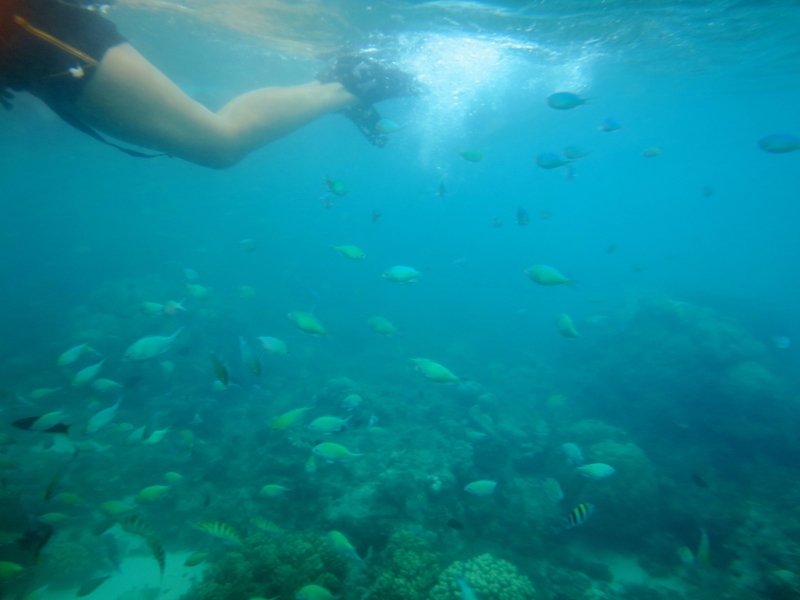 I loved sight of many corals so close to me, I got scared though when I saw an edge. It’s like an underwater cliff, I tried to take a glimpse of what could be beneath it, but all I saw was infinite depth. I imagined a monster coming out from it. haha. . 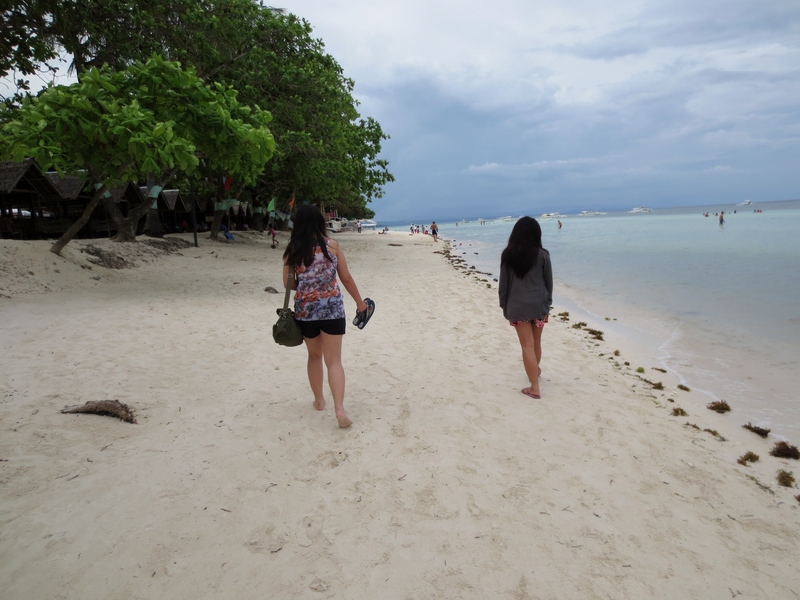 Sadly, there was a storm coming when we snorkeled, so the coast guards instructed all boats to return to Panglao. We have not even saw the island for half a day. 😦 Going back, the winds were too strong, and its coldness gave us chills. 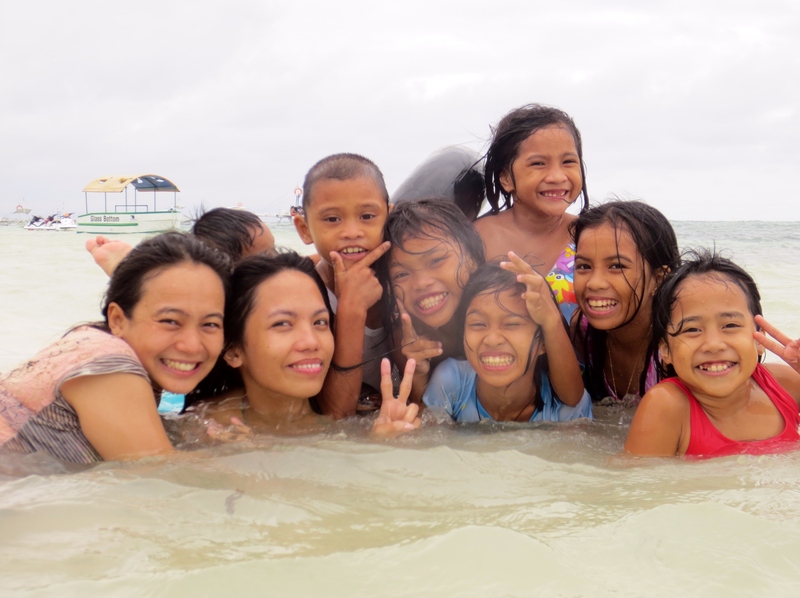 Luckily, we braved the strong waves, but of course it came with a lot of screaming! I bet the boatmen got confused whether to focus on maneuvering the boat or try to calm us. haha. .
yup, that’s the edge i was talkin about. scary, right? hehe. . 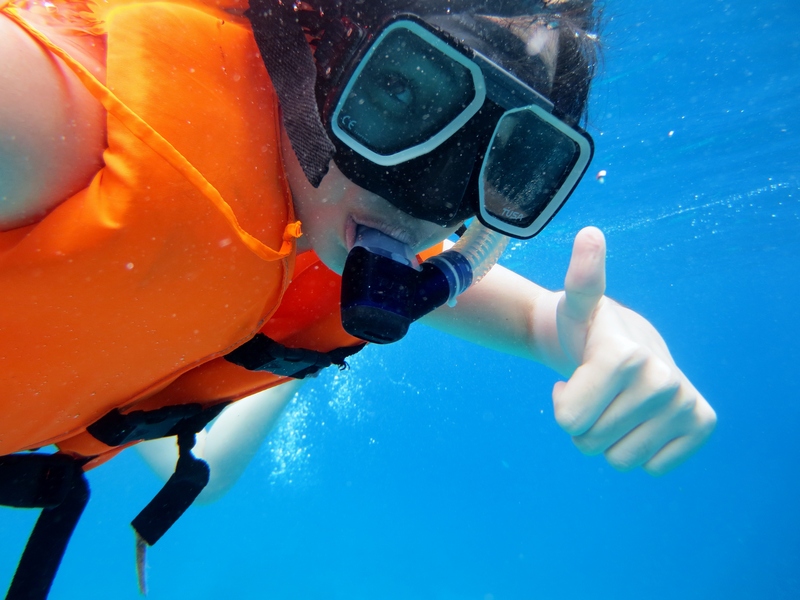 The corals suddenly just end here. the treacherous waves coming at us! it felt like in movies. Perfect Storm! haha. .
8. 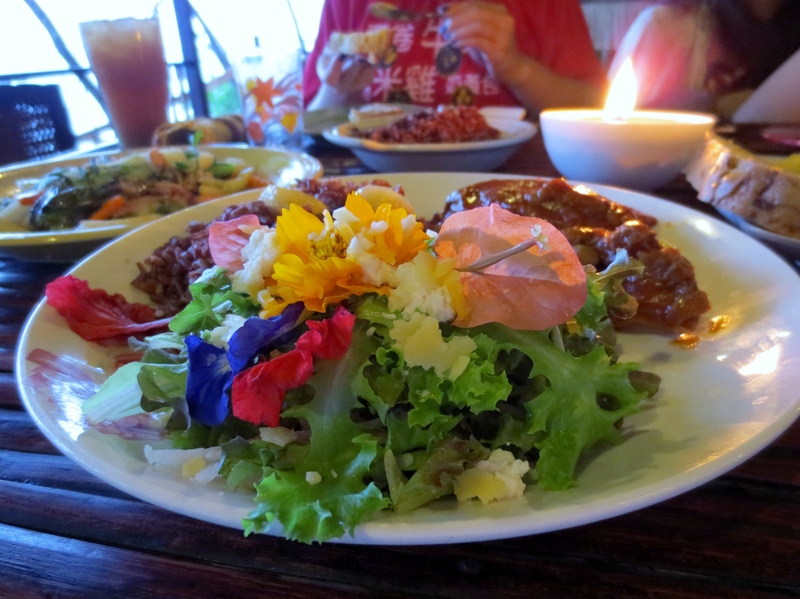 Bohol Bee Farm, and flower salad! 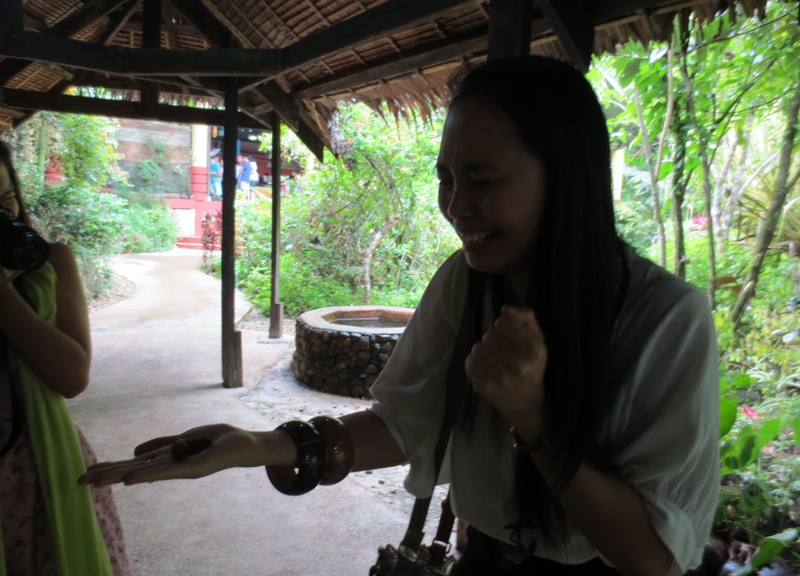 It was sad that Aubrey got sick when we visited the Bohol bee farm so it was only Myrna and I who enjoyed the sights. We ate organic dishes (i am sorry for this, but i didn’t enjoy the food as mush as i would want to, huhu) and had a fresh salad in mango syrup. Fresh FLOWER salad to be exact. It has the flowers that we have once in our garden in our house in Laguna. haha. . Oh and we said hello to thousands of bees. 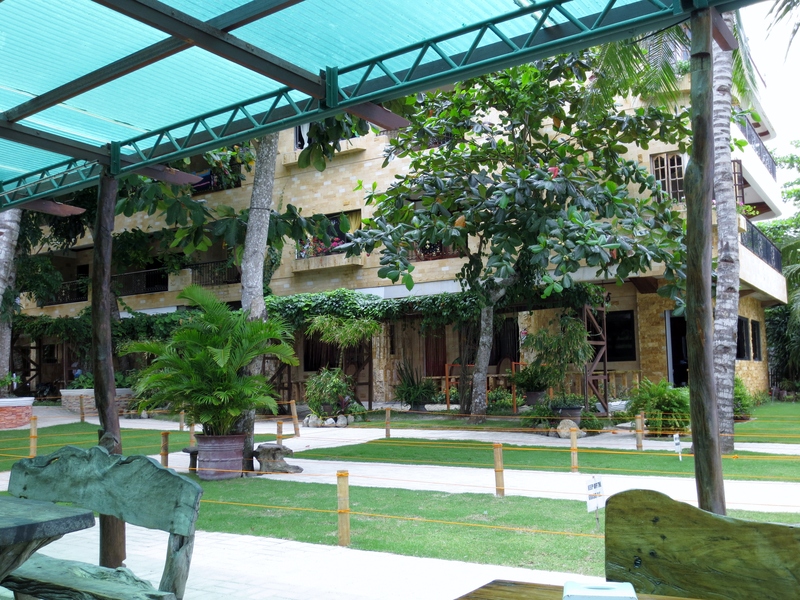 Myrna and I loved the ambiance of greeny environment, there are lots of plants. It’s also good to buy organic goods for your loved ones left back home. 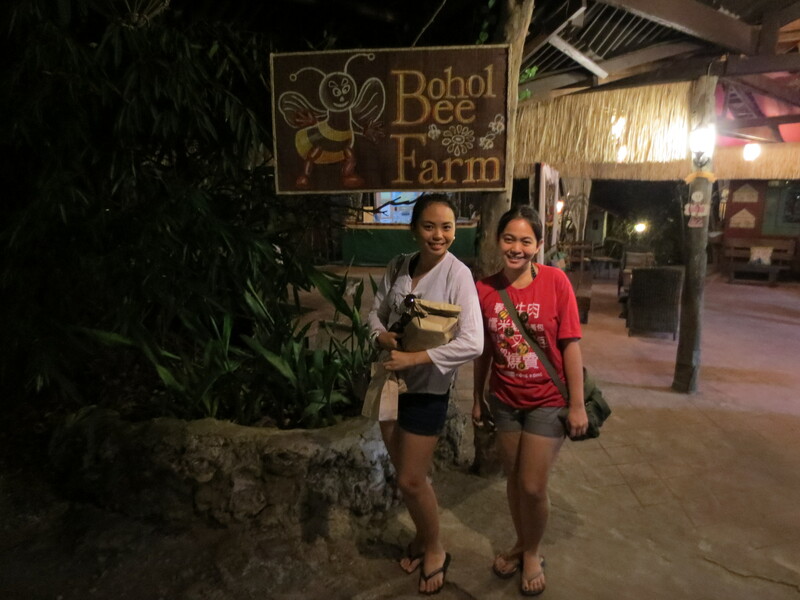 loved the simplicity of the cozy set up of Bohol Bee Farm. . the furniture designs are so Filipino. 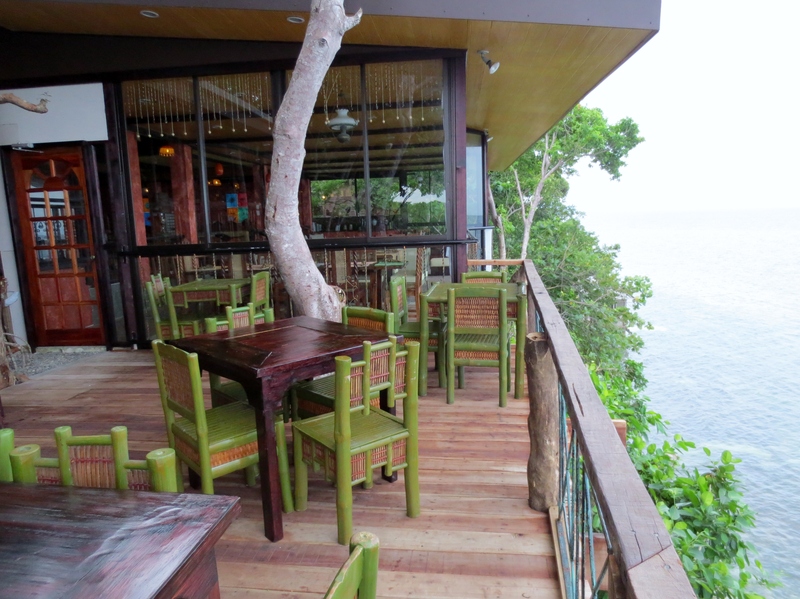 and this dining area just above the shore. with the view of the infinite seas. 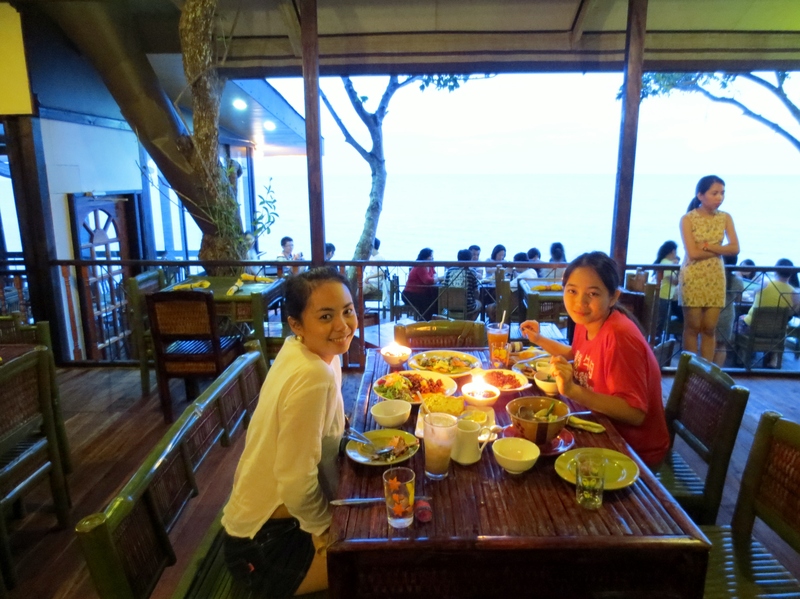 candle light dinner isn’t only for couples, it’s nice for best buds too. .
bought some organic goodies like honey, spreads, candies, etc. .
stop it, oh you. . . . haha. .
9. Old Baclayon church. . Before the ferocious earthquake last 2013. I will always remember how nice this old church was. 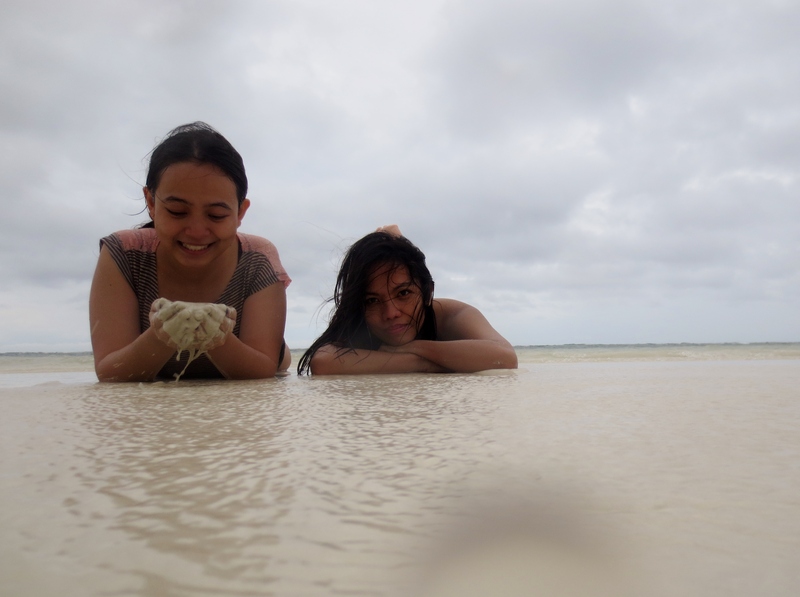 Sadly, it went down after a very strong earthquake that hit Bohol last 2013. The dark ambiance and smell of candles, gave us chills. . As if we were in a church during the Spanish regime like what we see in historical movies. 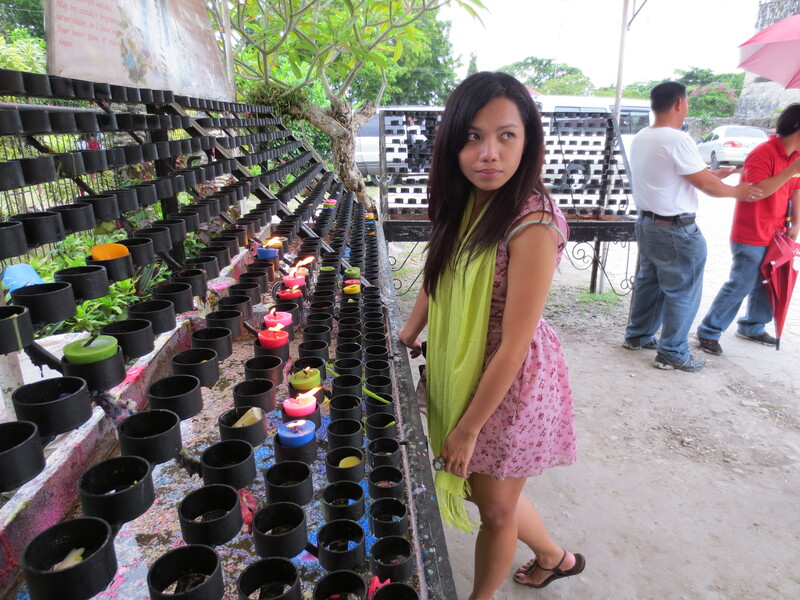 We also lit up candles which color depends on what you pray for. it’s like a wishing well or something. WHITE – for purity, Holiness & Virtue RED – for life, passion and courage; BLUE – for peace, inspiration & devotion; YELLOW – Good spirit, studying & concentration; VIOLET – material wealth; GREEN – money, marriage and employment; PINK – for health, love affection and romance; ORANGE – for brightness and business deals all —– 3 single ladies, i guess it’s pretty obvious what we chose. . hahaha. . Kidding! 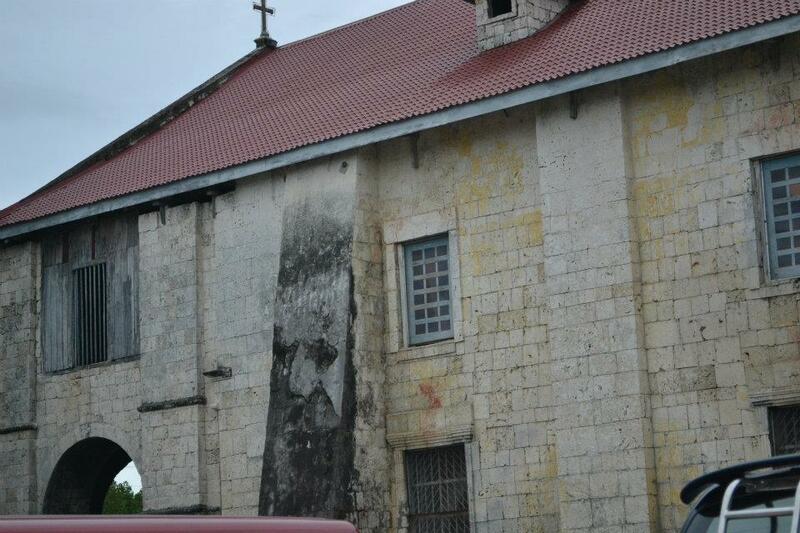 can you recognize the face on that blackening facade? 10. Buffet lunch at Loboc River cruise. with some Tinikings in between. . hehe. .
nailed it? naaaah! haha. .
11. 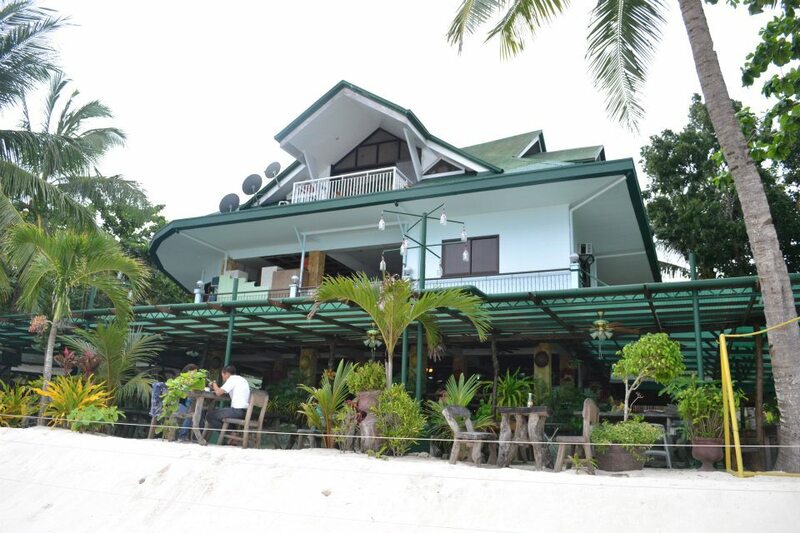 Dumaluan Resort, our accommodation in Panglao Island. Have you ever felt like Goldilocks going to a place where everything seemed designed for the baby bear? Not too hot, not too fancy, not too creepy, just right. That’s how we find Dumaluan Beach Resort. We think the price for this accommodation is all worth it. aint this dining area too nice with lots of yellow lights at night? 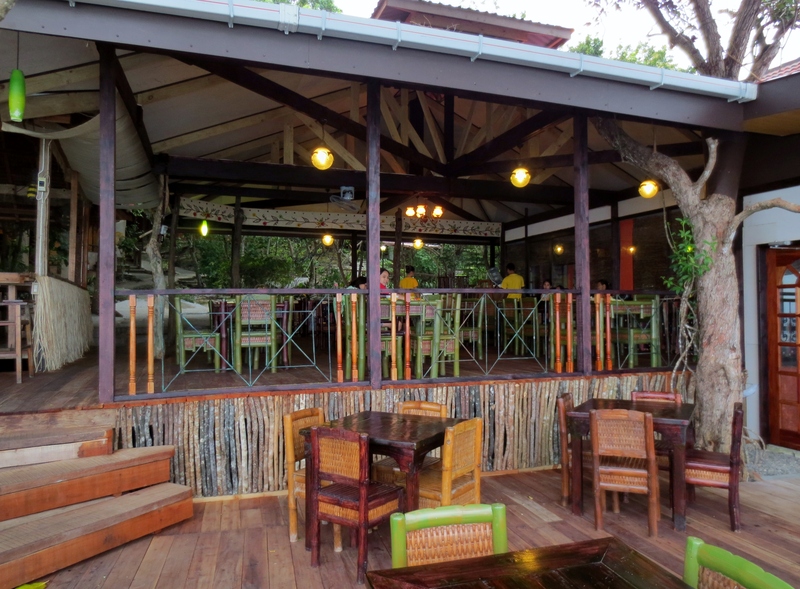 acoustic songs on the background while sipping our favorite cocktails is the thing here. relax! 12. B-E-A-C-H. . coz, who doesn’t love beaches? 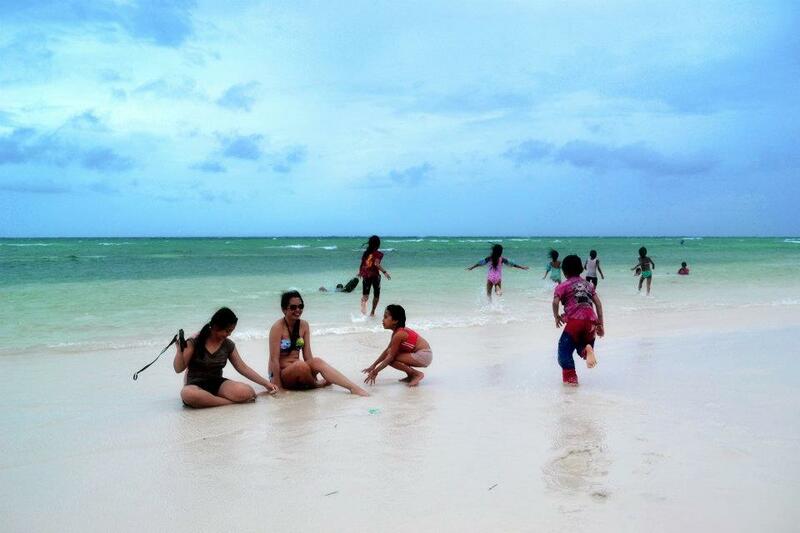 Beach addicts! 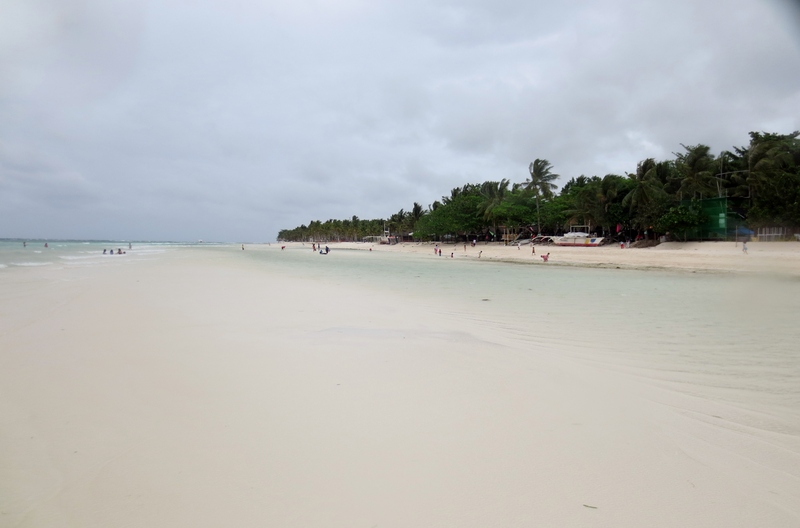 The real purpose of the trip is to hit the beach. . haha. . Panglao Island in Bohol boasts its powdery white sand and turquoise water. It’s safe for kids as the shore isnt steep. please excuse my beer belly. . haha. .